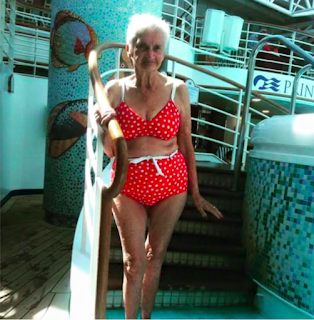 Ninety-year-old Irene Carney from Australia has gone viral as she shows that you can rock a bikini at any age. Encouraged by her friends and the carers at her nursing home to buy a bikini to wear on her cruise holiday, the great grandmother bought a trendy little retro polka dot number from a shop called Lady Watego in Byron Bay. While enjoying her cruise holiday she posed for a snapshot and sent it to the shop. The assistants were so impressed with the way she nailed the look, they shared it on their Facebook page which has since gone viral, being shared over 863 times and attracting hundreds of comments from people praising Irene’s body confidence. “Bloody hell…she looks better then me in a bikini and I’m almost half her age!! You ROCK Irene you beautiful woman! !” one woman wrote. “I’m nearly 40 and have never EVER Had my photo taken in a cozzi, let alone a 2-piece. She is beautiful and proud. Love it,” added another. Others commented how refreshing it was to see a ‘real’ woman flying the flag for body positivity. “This is a real picture of a beautiful lady. No photoshopping. More realism in the world please then people would not have as many body issues,” one supporter wrote.